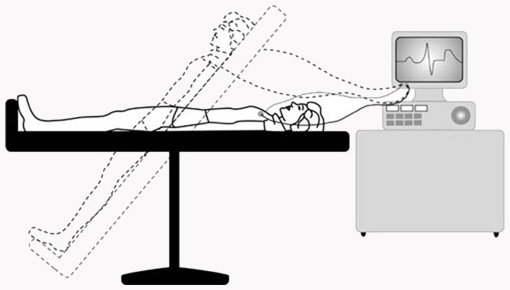 What does tilt table testing involve? Do I have to have an intravenous line placed? How long will the tilt table test take? Does everyone receive the infusion of isuprel? Can I drive home after the test? Why must I not eat before the test? If I have diabetes, should I take my medication on the morning of the test? When will my doctor receive the test results? At times, the nerves which control blood pressure may not operate properly and their stimulation may cause a reaction which can cause the blood pressure and/or the pulse to drop suddenly. This reaction may produce a fainting spell or a number of symptoms including severe lightheadedness. Tilt table testing is designed to determine the likelihood that a patient is susceptible to this type of reaction. Patients that have symptoms of passing out (fainting) whose diagnosis is unclear. Many patients who have vagal syncope can be diagnosed by history and physical examination. Some patients require the tilt table test to make this diagnosis. The first part of a tilt table test evaluates how blood pressure responds to the simple stress of standing up, or in other words, how the blood pressure responds to the stress of gravity. Patients are asked to remove their clothing above the waist, put on a hospital gown, and lie down on a special table. Patients are connected to an electrocardiogram (ECG) type machine, have a small cuff placed around a finger which measures blood pressure, and have a small intravenous line (IV) placed into a vein in the arm. We try to make the setting as relaxing as possible by dimming the lights and by turning on some soft music in the background. After everything is set up we collect baseline blood pressure and ECG data for 10 minutes while you lie quietly on the table. There are two reasons that we want every patient to have an intravenous line placed at the beginning of the study. First, it is conceivable (although rare), that a patient may have a reaction during the test that would require us to administer a medication intravenously. Even though the chance of such a reaction occurring is extremely rare, we prefer to have the intravenous line already in place as a safety measure. Second, many patients will require the infusion of a medicine, like isuprel, to complete their tilt table test. We can only administer the isuprel through the intravenous line. While it may seem possible to place the intravenous line after the first part of the test, we have found that it becomes too disruptive to stop after the first part of the test, place the intravenous line, and then go on to complete the second part of the test. For these two reasons, we require that the intravenous line be placed at the beginning of the test. We have had patients who have an extreme phobia to needles and/or to intravenous lines. If you have such a phobia, please let us know in advance and we will discuss the options with you prior to your test. The duration of the tilt table test depends in part on how you respond. The test is usually completed in 40 minutes. Not everyone will receive the infusion of isuprel Some patients develop the reaction which causes a fall in blood pressure during the first part of the test. Once we observe this type of reaction, the test is terminated and there is no need to administer the isuprel. Unfortunately, we cannot predict ahead of time which patients will require isuprel and which patients will develop the reaction without isuprel. A tilt table test is called positive if a patient develops a drop in blood pressure associated with symptoms. The symptoms that patients experience are varied and have included lightheadedness, nausea, a cold and clammy feeling, sweating, a “spacey” feeling, or a feeling like you are about to black out. Rarely, blood pressure falls without the patient developing symptoms. In these cases, we try to continue the test until the patient develops symptoms. If the patient is able to complete the protocol without developing symptoms despite a fall in blood pressure, we call this a borderline test. Some patients develop symptoms even though their blood pressure remains normal. While this would be considered a negative test, we do report the symptoms in the report and the corresponding blood pressure. In these cases the symptoms are not explained by changes in blood pressure or heart rate. Many patients who have a positive test feel a little unsettled and sometimes queasy for the first few minutes after the test. We allow patients to fully recover prior to having them stand up and get dressed. The vast majority of patients will return to feeling completely normal within 5 to 10 minutes after the test. Rarely, a patient may continue to experience weakness or fatigue for a longer period of time after the test. Patients that have a negative test often report that the test was tiring but otherwise feel fine. If the patient received isuprel during the test, the effects of isuprel wear off within a few minutes of stopping the infusion. Many patients will drive home after the test. Since most patients return to feeling normal within 15 minutes after the test, there is no problem driving home after the test. The test itself, whether positive or negative, however, is quite tiring. For patients that live some distance from the hospital, we encourage them to bring someone else along with them who can drive them home in case the patient feels too tired to drive a long distance. We ask that patients not eat for at least 4 hours prior to the test. For patients who have their tests scheduled in the morning, we ask that they not eat after midnight the night before the test. This is important for a few reasons. The way in which blood pressure is regulated is slightly different before and after a meal. In order to be able to properly interpret a test, we need to have the test done after the patient has not eaten for at least 4-8 hours. In addition, rare patients become quite nauseated during a reaction that causes blood pressure for fall. While it is extremely uncommon for a patient to actually vomit during such a reaction, it is important that the stomach be empty. For patients that have their test scheduled in the afternoon, we ask that they eat only a light breakfast and nothing for lunch. It is acceptable for a patient to have a few sips of water or juice in the morning to take a pill or just to moisten the palette. Patients that have diabetes mellitus and are using insulin or taking medication to control their blood sugar should talk to their doctor prior to their tilt table test. Usually, patients with diabetes will have to adjust their insulin or their medication on the day of their tilt table test in order to avoid their blood sugar from dropping too low. The results are known immediately.